On the 8th of June last week People Communicate hosted its first seminar and workshop on education change at Leerpark in Rotterdam, The Netherlands. A delegation of 15 high-level influencers and decision makers from The Normandy Region flew in for the day to visit Leerpark, a unique and innovative vocational education college in Dordrecht. The French teams objective was to learn what the key principles and strategies are which has made this €200 million project, with an 11-year history, a beacon of education reform. Present for People Communicate were Chris Heron education reformer and e learning consultant, Max Hoefeijzers, a consultant to People Communicate and the founder of Leerpark and WimFroon, business and property consultant. The day kicked off with a welcome, brief history and response from the French team in which they laid out what they were seeking to gain from the day. The main goal of the Normandaise was to dramatically and quickly reduce the 27% youth unemployment prevalent in their area but common to the rest of the French economy. The opening addresses were followed by a tour of the campus, meeting students and teachers and a brief business like Dutch lunch which was a bit of a shock to the French visitors! The afternoon began with a workshop in which the key principles and history were discussed by a panel of companies and key Leerpark team members who answered questions from the visitors. The companies represented were Innovam, Leo Fransen CEO, (Apprentice Training for the Automotive Industry), Valk Welding Michael Devos, Branch Manager and Adrianne Broere, Managing Director, (Robotic Welding). For Leerpark we were honoured to have Rhein Meisters, CEO of the Sustainability Factory in which the event was hosted. Rhein is also Chairman of the Board of Directors for the whole development and a leading political figure in the area. 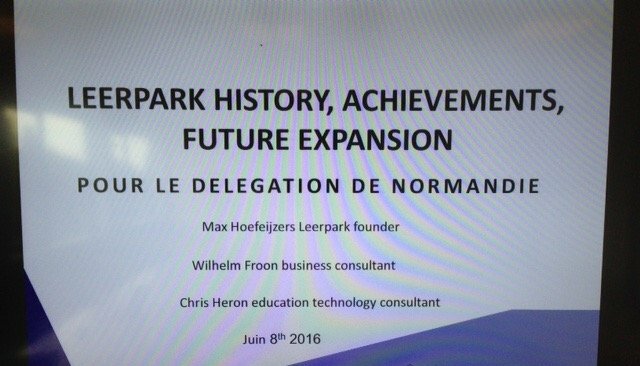 The discussion was chaired by Chris Heron and despite some language difficulties, a forthright debate dealt with issues such as the nature of the relationship between commercial partners and Leerpark, the funding and finance of the park, the inspiration and difficulties in setting it up, the proof of success, the economic and political results, accreditation and the relationship with the education authorities and many other topics. From the outset, there was great scepticism as to whether it was possible to recreate the key factors for success in a different country which had its own challenges and cultural barriers for this type of programme. Could the model work in France? Would the commercial organisations wish to participate? How would it be certified? How could it me managed? The overall conclusion was that the model was extraordinary and that the difficulties would have to be overcome as they had been 11 years ago in Holland. Of particular interest was the new Vivagogy concept and its online information management system which Chris Heron described as ‘a tool to empower all the stakeholders in the process of education change’. The days events were summarised by a fascinating talk by a Governer of the area Mr Berd Van der Berg who described the political, cultural and economic history of the project and how the problems at its inception were overcome. A very tiring but stimulating day ended with a quiet drink in the Dutch sunshine before the next round of debate and strategic development in Normandy in late June. It was an inspiring day in unique setting and we look forward to playing our part in helping to shape the future of education and learning with our French partners. We now begin to carry this message to a wider global audience who are also in need of a solution to this global problem which has become known as The Skills Gap.